Please Note: This is an imported, natural product and could possibly be ink stamped in some areas, have seams, or other inconsistencies. For a more refined fabric, please see our colored burlap selection. Cheap, high-quality 10 oz burlap between 58"- 60" width. Natural, untreated, and hydrocarbon-free. An ideal burlap for winter shrub and tree protection. Great for decorative uses too. Sold by the yard and at bulk discounts. The more you buy, the more you save. I am using this for a couple of backdrops and table decor for a college graduation. Good price & no stores near me have this type of fabric in stock. I will use it to cover bushes to protect them from heavy winter snow. Using the fabric to cover wood at our county fair. it is the width necessary. 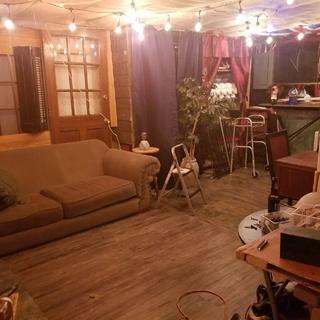 Gonna make curtains to cover the garage doors for a rustic theme engagement party. We use this burlap for wrapping our roasts before we put them into our deep-pit BBQ. We use it extensively for decorating as well. We bought this for the past couple of years and it works perfectly! We have an "in the woods" get away and we like to entertain there. So burlap is our go to decorating medium. I needed 60" wide burlap and the reviews were great. We have checked other places and your prices are the best. I chose this fabric to cover the bulletin boards in my tropically themed classroom. Cover for a craft fair display table. Rustic birdhouses. Multipurpose for shabby chic home! I'm going to sew this to use as a shade cloth for my flower bed. The hot Texas sun would burn and kill my tender plants. For Decorating for Easter at my church. Needed to protect fruit trees (fig) from Central Tennessee winter weather. Good quantity at a good price. I need to make curtains for a play. this was the best deal I found. Will use this to wrap shrubs for the winter. need It for Project and it was Cheap. For the sole purpose of wrapping perennial flora to prevent freezing during winter. My church has a pumpkin patch each Fall in Oct. We are using black plastic pallets this year, and I want to cover them to look rustic. Because of the width. We're doing a play and need to cover a number of 4x9 flats. Burlap provides the rustic quality we're trying to achieve. I hoping this will work on decorations for our country western theme for a golf tournament. I chose this product because of the 60 inch with and the fact that it is a natural burlap fabric. This was the best site I found on line for shipping costs which made it quite a good deal. Making tablecloths and backdrops for a wedding. I was thinking about using this as a curtain for a barn wedding as your entering the barn doors do you think I could use this and about how many yards do you think I need? BEST ANSWER: Many people use this product for curtains. As to how many yards you would need, that depend on how large the window is and how much of a drape you want. Does it fray on side edges or are the edges sewn? BEST ANSWER: The selvage edges on the sides don't fray. Would this be okay to use as tablecloth? BEST ANSWER: Yes, this would absolutely work for a tablecloth. I use this burlap in my etsy shop to make table runners, placemats, burlap bags, valances and tree skirts for Christmas. Can this burlap be used to store onions or potatoes in? What would be a good fabric to imitate Mud cloth? BEST ANSWER: If it is going to be decorative (not clothing), this burlap may have a similar appearance. Burlap is scratchy so you wouldn't want it to be against skin. Our sultana burlap has a weave that's tighter than this burlap, so that may work better. We recommend ordering a sample to be sure that it will work for your project. Depends on application, but I would probably use something like muslin. Mud cloth is a handwoven cotton fabric that is painted or dyed and then fermented in mud. Is this the kind of burlap I would use for reupholstering? BEST ANSWER: You could use it for that, but many people choose to use sagless burlap instead. 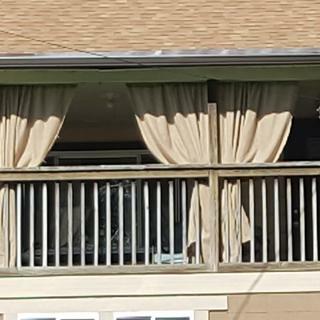 I am looking for burlap to make curtains for garage windows, and I want it to be somewhat see-through. Would this work? BEST ANSWER: Yes, it will be somewhat see through but not sheer. is this burlap washed and wrinkle free? Yes, we ordered 100 yards and it came on a big bolt and was perfect for what we needed which was to wrap a building with it and back light it for a wedding. It was not folded or no wrinkles. Regarding washed, I am not sure or that. Can this product be used for outdoor curtains? BEST ANSWER: Burlap disintegrates relatively quickly in outdoor conditions, so we wouldn't recommend it for long term use. That is what I made them for. They will rot and fade in the sun over time. Mine were going up for a wedding. would this fabric do well for rug hooking? BEST ANSWER: We haven't had anyone ask about that use before, so we aren't sure. We recommend ordering a sample to be sure that it will work for your project. Yes, the edges are finished so it doesn't fray. I was wondering how they were finished, if it was neat edge or fringed finish? I have 60" round tables that I'm looking to cover for a graduation party. I have 4 tables and also 3 banquet tables at 6 foot each table. Can you tell me how much fabric I would have to buy in order for the burlap to overhang and hit the floor? Would I be able to order this in 8 foot strips? I would need a total of 13. BEST ANSWER: We don't generally do special cuts, but you can inquire with our customer service: help@onlinefabricstore.net or 877-781-2967 Monday - Friday, 9am - 5pm EST. Do you have a 72" natural burlap roll? BEST ANSWER: 60 inches is the widest option we have. I was wondering if this burlap would be good for window curtains or what do you recommend. And some burlap have a strong odor will this? Is the natural burlap strong enough to use as a patio swing seat and back rest? Will it support the weight of a 2-225 lb men? BEST ANSWER: This item is not intended for weight bearing use. Does burlap come in color, if not can it be dyed? I want to use this product to make small curtains. Will it hold its shape? Can it be hand washed and dripped dry and retain it's shape? Will the washing discolour the fabric -- or cause "bleeding" or running of colour? BEST ANSWER: While people do use this burlap for curtains, it can have inconsistencies since it was originally intended for utilitarian purposes. We suggest Sultana Burlap for decorative purposes. Sultana burlap should be hand washed with cold water and a small amount of gentle detergent. Do not leave in water to soak. Rinse the fabric well and leave it to dry flat between two towels or hang to dry. I have decided to use burlap as a ceiling cover in my finished basement. Would this burlap hold its shape? I have seen this used like this before and liked it. what do you think, is this a good idea? BEST ANSWER: People do use it for ceilings, but we generally do not recommend using burlap as a ceiling cover as it is flammable and may shed fibers. would this be the correct burlap to wrap shrubs and azaleas from deer damage during winter? BEST ANSWER: Yes, this burlap would work. Looking for an upholstery weight burlap. I have bought it in the past from another vendor for about 12.00 a yard.. do you carry anything like this? Can this burlap be used for table toppers? Planning to use them for a rustic wedding look. Is this the kind of burlap I would use for winterizing plants? I am trying to order 10 yards at $2.40 per yard, when adding this to my cart, I am charged $228.....what is the Problem? Is it me? BEST ANSWER: It could be that you have more yards than you need in your cart already. If you require assistance, please contact our customer service at either help@onlinefabricstore.net or 877-781-2967 Monday - Friday, 9am - 5pm EST. Would this burlap fabric be good for creating a reading hut in a classroom? I will use it for the roof and sides? BEST ANSWER: We recommend FR burlap for any sort of classroom application. Will this work for a wedding aisle runner? How many yards are in a full roll of 60"burlap? Local fabric stores don't carry this size or amount I needed for my porch. Easy to sew, unbeatable price. Very very happy customer! We used it to cover the basement ceiling in a craft room we’re currently making. Looks great! 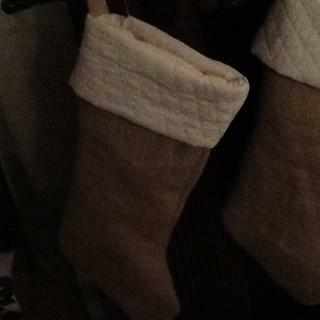 I used this burlap to make Christmas stockings. The color is perfect. The sewing needle went right through did not get stuck. It does fray after you cut it; however that's what burlap does.. Once you stitch the material it will stop it from fraying. 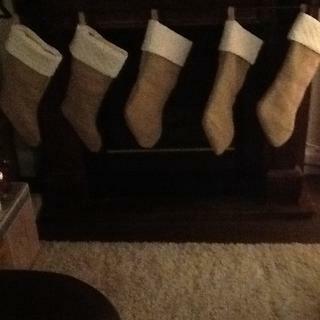 I bought 2 yards and made 5 stocking and still have enough for 3 or 4 more. I also purchased the cream color diamond quilt for top of stockings and I lined my stockers with linen. Arrived as described, smell was very mild (in the past I’ve had some stinky burlap!). Sewed up beautifully, I was making curtains. This burlap is the perfect width for wrapping/protecting cold-sensitive palm trees and Esperanza bushes. I wanted this burlap for use as a curtain in a set for a local production. The director wanted ratty looking burlap, the description said it might have seams and printings . Perfect, except it was too perfect. I was happy with the quality and the ease of purchasing and speed of delivery. Would use Fabrics online again. The product arrived ahead of schedule and in perfect condition. It was well priced and was exactly what i needed for the job to encase a dirt bern i constructed to divert water from a neighbor. It will eventually become a landscape feature with beautiful trees and ground cover. Thank you very much for a wonderful product. Very nice burlap. I am using this for window treatments. It is the perfect weight & looks great on my windows. Shipping was super fast. I love ordering from OLFS. Always great quality products & excellent customer service. Wanted the fabic to drape my Antique & Home Accent Booth. Worked perfectly. Very pleased. Photo would not upload so I cannot share.